THE last United States female veteran from World War I, Charlotte Winters, died on March 27. She was 109. Her death received considerable publicity, even here in Australia, and she was buried with full military honours. It is a different story with our female veterans in Australia. 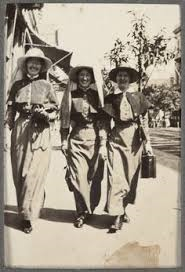 While we have been searching out our last World War I diggers, counting them down with great public fanfare, including offering their families state funerals, we ignored the nurses. We might have forgotten the nurses of World War I but let’s not do the same to our female veterans of World War II. We should commemorate, equally, the sacrifices of all, whether they are men or women. On Anzac Day this year let’s make a special effort to remember female veterans from all conflicts. It’s the least we can do.